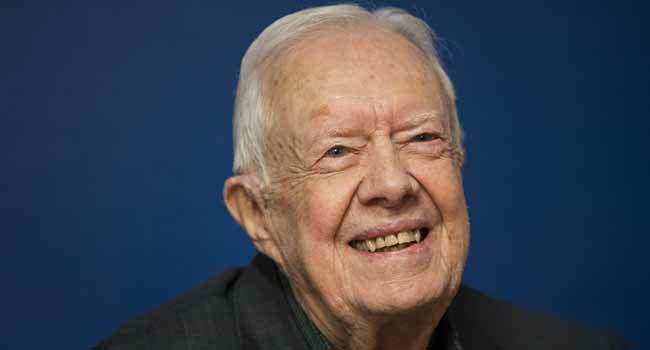 Former president Jimmy Carter has warned that the United States has “abandoned” its standing as the premier champion of human rights, showing “indifference” to abuse at home and abroad. “The United States has already lost its place as a leader of protecting people and their human rights,” the Democratic ex-president told a Human Rights Defenders Forum on Tuesday at the Carter Center in Atlanta. “We still have a chance to restore our position as the foremost champion of human rights, but we are not in that position at this moment,” said Carter, who won the 2002 Nobel Peace Prize for his work promoting human rights, democracy and development. “If we retain our present position of indifference to human rights violations, we’ll encourage” such violations to grow even more rapidly than they have in recent years, he stressed. The 93-year-old Carter, who was speaking to dozens of human rights experts from around the world, noted that the United States was at the forefront seven decades ago when it led the United Nations to proclaim the Universal Declaration of Human Rights. But the US government’s dramatic clampdowns on civil liberties following the September 11 terror attacks in 2001 helped shred American credibility, Carter said. “So we have abandoned, basically, our position as a government to be the champion of human rights,” added the former president, who made rights concerns a central pillar of his foreign policy during his term in office. Current US President Donald Trump has placed little emphasis on human rights, instead often praising, or turning a blind eye to, the words and actions of authoritarian-minded rulers in countries from the Philippines to Russia — even to North Korean dictator Kim Jong Un.